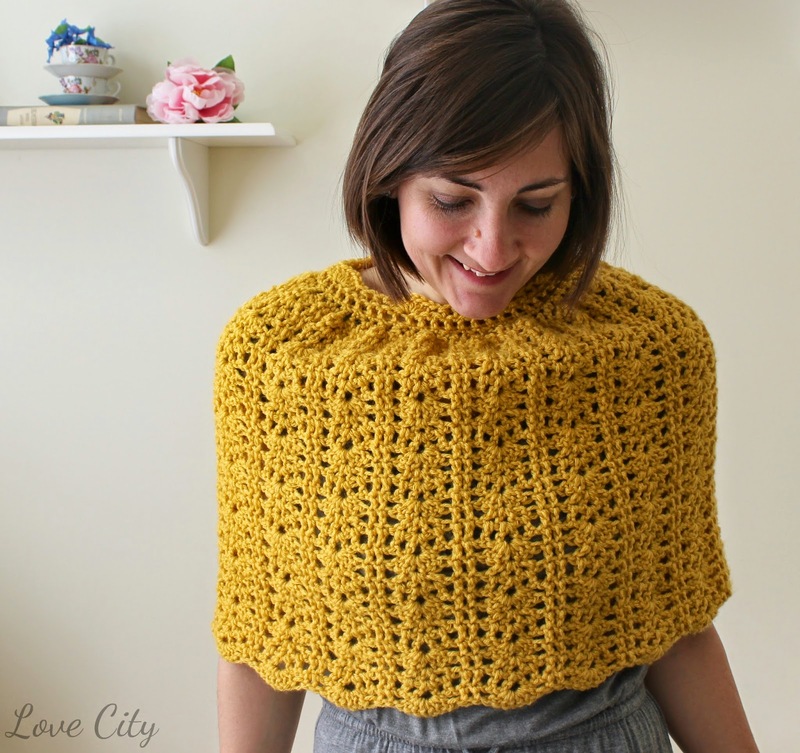 I have this love for capes and caplets and anything of the sort, which I think stems from my love of all things vintage and old fashioned. 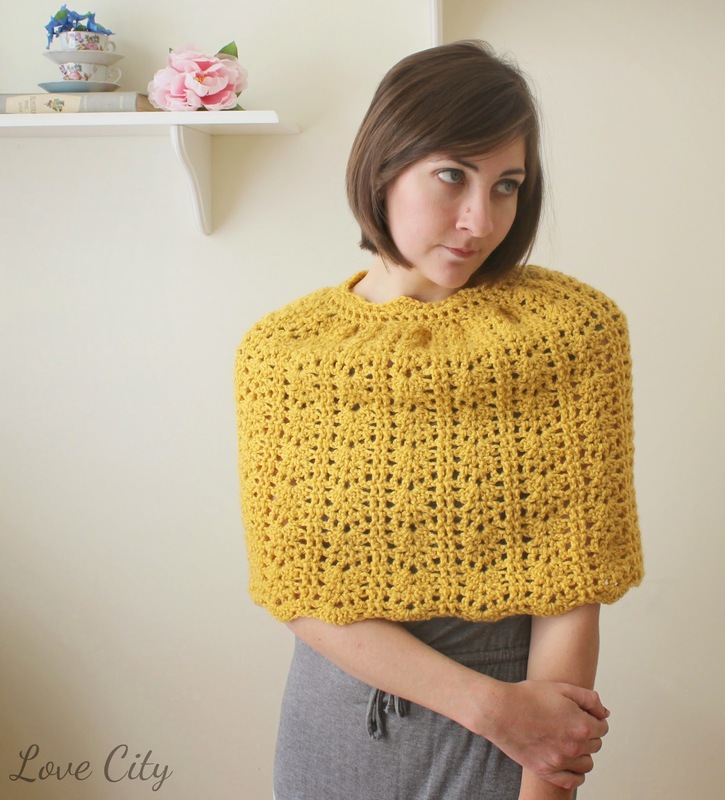 This lacy bell caplet is nod to those loves of mine. It is such a versatile piece as well. 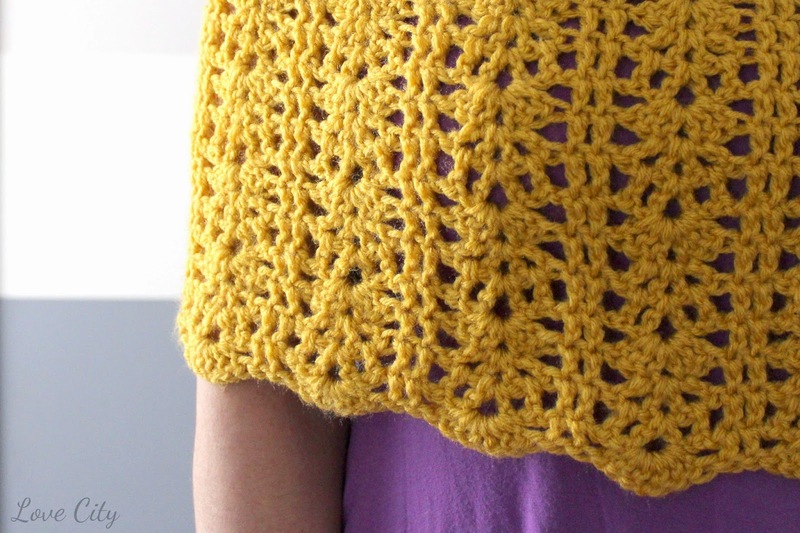 It can be worn for extra warmth over a winter coat, or as a light cover up over a spring dress. 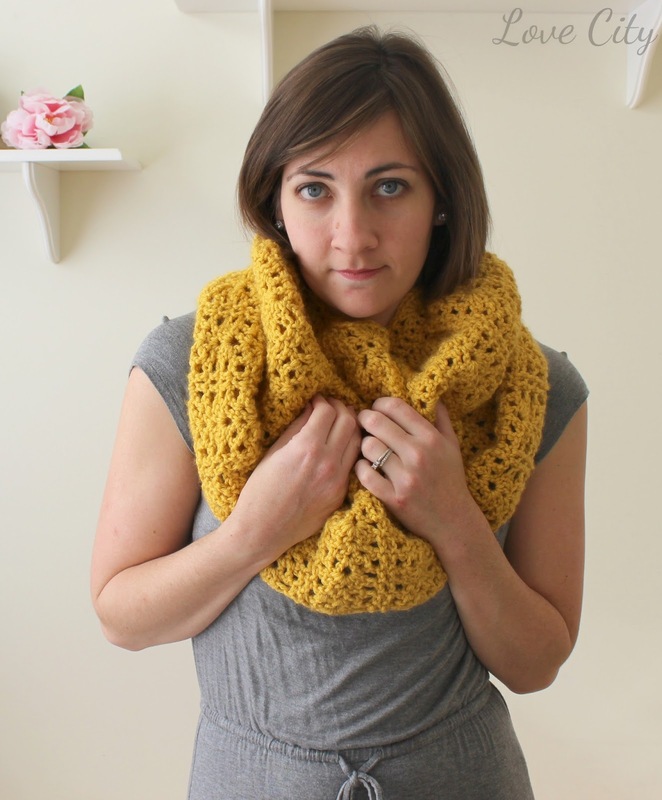 It also looks great bunched up as a cowl! This patterns is written for a size small adult, but it includes instructions for adjusting to any size you may need! 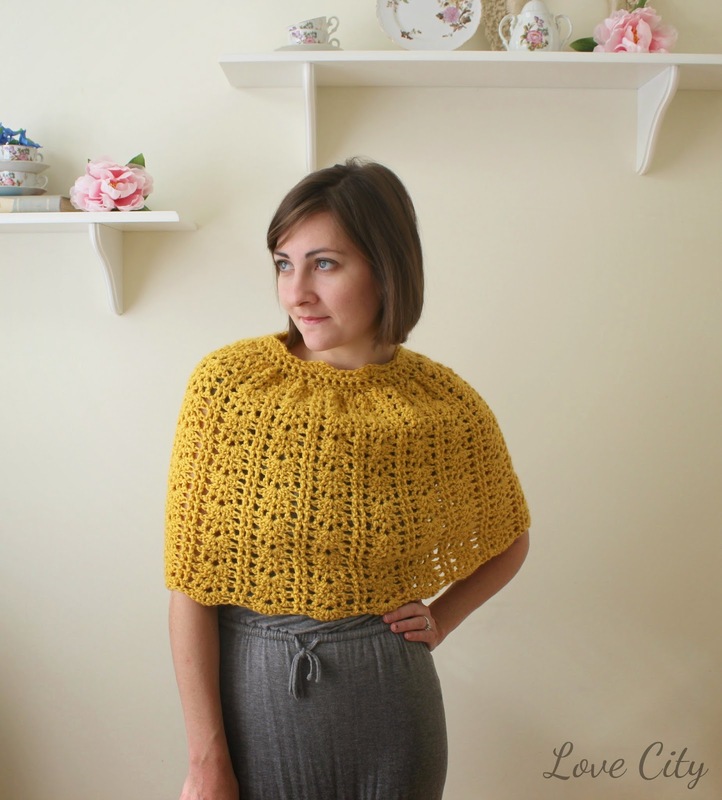 This crochet caplet uses mainly double crochets worked in the round, in a series of shell stitches. This pattern gives the garment a beautiful lacy texture. I used a worsted weight yarn and a size I crochet hook. you need in your foundation chain. loop of first ch 2. 2. Ch 2. Dc in next st. Sk next 2 sts. Dc in next st. Ch 1. (dc, ch 1, dc) in ch 1 space. Ch 1. 3. Ch 2. Dc in next st. Ch 1. Dc in next ch 1 space. Ch 1. (dc, ch 2, dc) in next ch 1 space. in top loop of first ch 2.
in ch 2 space. ** Repeat *-** around. Sl st in top loop of first ch 2. 5. Repeat steps 2-4 as a set until piece measure approximately 17 inches long. Fasten off. (16 shells total around bottom edge). gather the top of your piece. Sl st in top loop of ch 1. (48 total sc). 7. Ch 2. Dc in each st around. Sl st in top loop of first ch 2. (48 total dc). 8. Ch 2. Dc in next st. Sk next 2 sts. (3 dc, ch 1, 3 dc) in next st. Sk next 2 sts. *Dc in next st.
loop of first ch 2 (7 shells total). 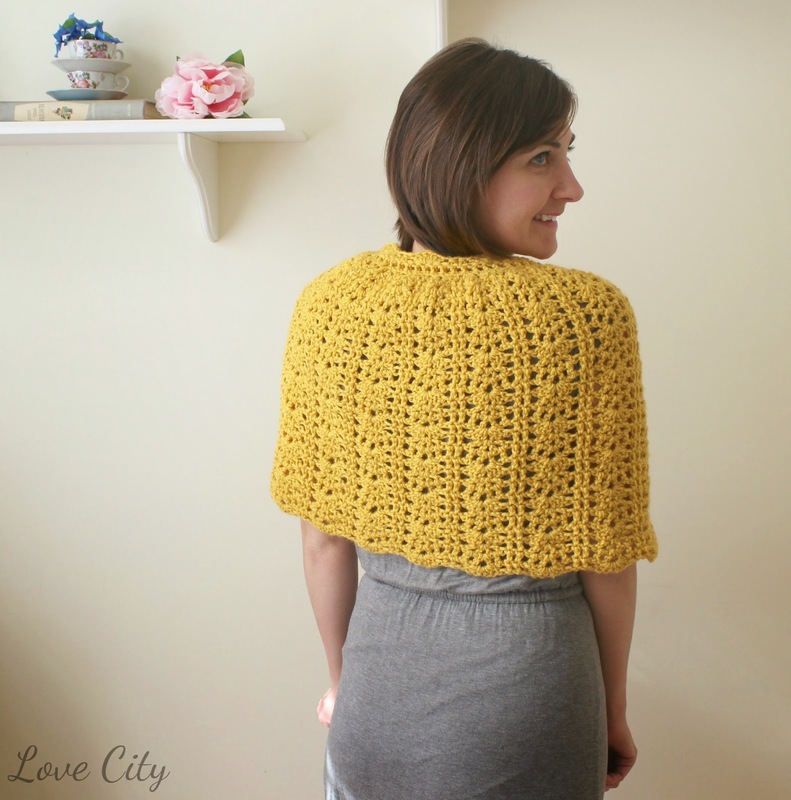 Please send any questions over to LindsayHaynie@gmail.com and as always, share your finished products with me by tagging them with #LoveCityCrochet on Instagram! I can't wait to see what you're making!